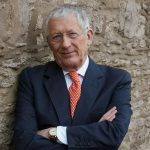 The star of Countdown and The Apprentice, Nick Hewer will be discussing his new memoir My Alphabet, from A for Apprentice (of course) to Z for ‘Zed list celebs’. Along the way, he discusses Determination and how to get it, offers insights from growing Old, and reveals his greatest Regrets. As one of Lord Sugar’s closest advisers, Nick Hewer was recruited onto The Apprentice and quickly developed a reputation for his wry sense of humour, while his astute insights won him a cult following. When he became the new presenter of Countdown in 2012, ratings went through the roof.